Rockstar Games just released the mobile version of cult classic Bully which you can free download directly onto your Android from the link below on APKTRON. This game will require over 2GB of storage space on your device to install the apk and obb file, and will probably need a high end phone or tablet to play without lags or errors! I've also included A hack version with unlimited money, have fun! 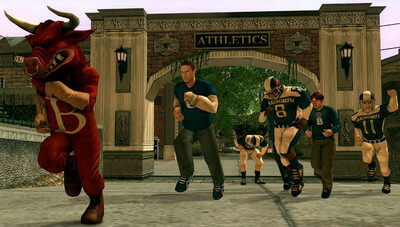 Bully: Anniversary Edition, just like the original PC version, tells the story of high school student Jimmy Hopkins at Bullworth Academy. He's a mischievous and troubled kid dumped there by his mum and must bully others or get bullied himself. What are you waiting for?! grab the apk below, relive the complete Bully story adventure and enjoy the sarcastic quips of your schoolmates, the brand new awesome mini-games, and all the demented characters you have to deal with. • A link to the Rockstar Games Support Site article "Bully: Anniversary Edition Settings, Controls & How-To’s" is now accessible in-game by clicking the question mark icon above the map in the pause screen. • The correct state flag for Indiana has been updated in Geography Class for Friend Challenges. • Help Text for entering manual aim view during the mission Tad’s House will now repeat until the player enters that view. • Consumo high score has been lowered from 1010 to 800. Install v1.0.0.17 apk or mod, Unpack DATA to sd card /Android/Obb/ , and have fun! Don't forget to also download GTA San Andreas if you're into open world do-whatever-you-like games which include fighting, driving, and such all packed into one package, also made by Rockstar Games.